Now you see it; soon you won’t. Here’s an update on the Albany scene, literally the scene. Pretty soon there will be nothing but empty space where the former Hollywood video store sits on Santiam Highway. The video company folded several years ago, and the building has sat unused for most of the time since. 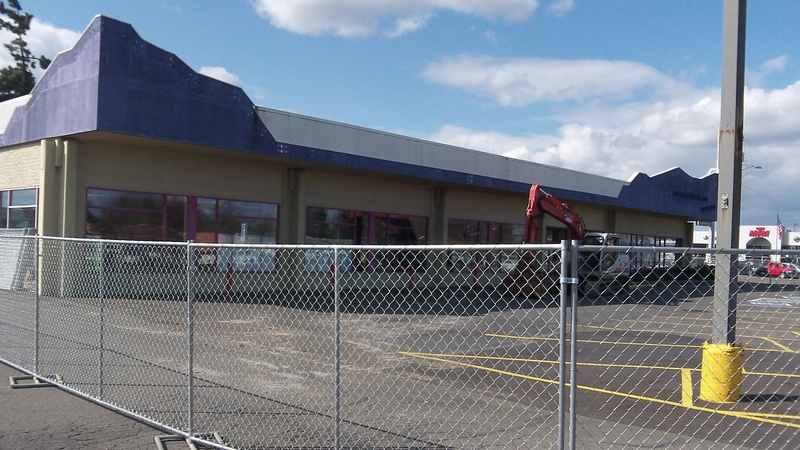 Most recently it was used as a shop and storage area for last year’s big remodeling job at Fred Meyer, which owns the property. Yesterday I saw new construction fencing all around the old building and a big piece of earth-moving machinery parked inside the fence, so I figured something was about to change. It’s easier to accept this change than changes in other “industries,” like, say, newspapers. I remember browsing in the store and using their “dropbox,” which is what I pictured when someone wanted to give me access to their electronic dropbox. This seems like too prime a commercial site to remain as grass. I guess Freddy’s will decide what and when.